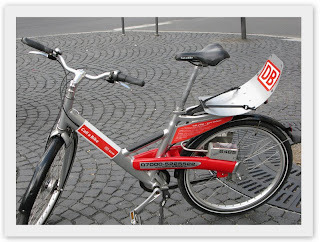 An idea from the DB (German Rail Company), you can rent a bike to go anywhere in the city. The process is simple - initial registration in the internet or with a phone call, get a code and key in that number on the input display underneath the cover to release the lock and you can then remove the bolt. You now ready to go! The DB company will charge you debit or credit card for 0.08 cents a minute and a maximum of 9 Euros for 24hrs. To return the bike simply lock the bike to a traffic sign or cycle stand at the next major crossroads. After you have closed the lock and pressed the button, the display will show the words “Return bike” (Yes/No). Press “Yes” and you will receive a receipt code to complete the process. You see these bikes all over Frankfurt, what a great idea!